Matara schoolboy weaves bogus story of abduction, for lack of confidence to face exam! 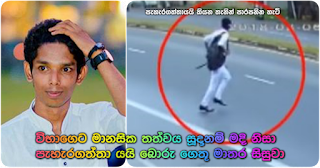 The incident where a 19 year old schoolboy was on his way to Matara St. Thomas' Boys College to sit for the Combined Maths question paper held yesterday for the advanced level examination was kidnapped and was stranded at a certain location and that therefore he was unable to sit for the exam was reported to police; with this news gaining special focus today in the media. police, the police had taken action to carry out special investigations on the matter, making an inspection on the spot where he was supposed to have been abducted. However what transpired on that occasion was that there was no such form of kidnapping had taken place at thesaid location and instead he had been walking and had crossed the road with no problem at all. Subsequently, he had in fact walked peacefully at other points too and had finally boarded a bus ... all of which was marked. Under these circumstances, he had been interrogated in a complex manner in which instance the boy himself had admitted that it was a bogus complaint that he had made. He had further made mention that since he was in a mental state lacking in self-confidence not sufficient to face the paper, he had woven this false story. He added that he had thought of making such a false comment because his parents had pinned great hopes on him in facing the advanced level and that he was not properly equipped to answer the Compound Maths paper and that his parents had hoped for all-island results on this occasion. He had also mentioned that since his parents had gone to the extent of taking this issue to police he had thought that the lie he told would come to light. Action is to be taken in future against the boy for having made a bogus complaint to police.